What are Foot Stress Fractures and How Can I Avoid Them? Foot stress fractures are present when the bone has been cracked or broken. There are two types of stress fractures: the traumatic fracture and the stress fracture. 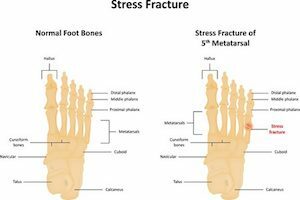 Traumatic foot stress fractures can occur after an event of great force, such as that of a car wreck, a physical altercation, or a long fall. The force created during these events has the strength to crack or break bones and, depending on the amount of force, the event could result in multiple broken bones at a time. Foot stress fractures can occur after an event that creates a smaller amount of force which is repeatedly applied in the same spot. In these instances, the bone may crack or break but does not move out of place as is the case with the traumatic fracture. Foot stress fracture are most common in people with thin bones, such as those with osteoporosis. It may also occur in people with strong bones but that play very physical sports like soccer or basketball. A large number of stress fractures occur in the feet, the area of the body that is most used in daily errands and sports. Preventative care can provide the essentials for a healthy and active lifestyle. Doctors recommend eating diets that are high in calcium and vitamin D to maintain or increase bone density. They also advise the practice of cross training, which is the practice of alternating physical activities on a regular basis. This can include creating a routine of swimming, biking, and jogging with slow introductions into new sports. Those with active lifestyles also need to wear high quality, good fitting shoes. These shoes need to be supportive and well padded, and preferably made for the sport they are being used for. And, as always, most doctors recommend not smoking because the nicotine in cigarettes can prevent the body from healing properly. Longer healing times means less enjoyable active time. Those with active lifestyles need to go for annual checkups to ensure the continuation of good health and to provide preventative care or treatment for minor issues. When small issues are treated promptly, healing times, if any, are reduced significantly allowing for a full and active lifestyle. The professionals at Michigan Podiatry provide professional and prompt services for the entire family. New patients are invited to make an appointment for an annual checkup or to obtain treatment for a sports-related injury today. Michigan Podiatry also provides emergency services.